Pink Flowers – Do you feel your traditional garden adorning the green backyard is less appealing? Grow the pink flower plant to add a pop of shine of the grassy patch. They not only coddle everyone’s eyes, but boost your uncertain mood. 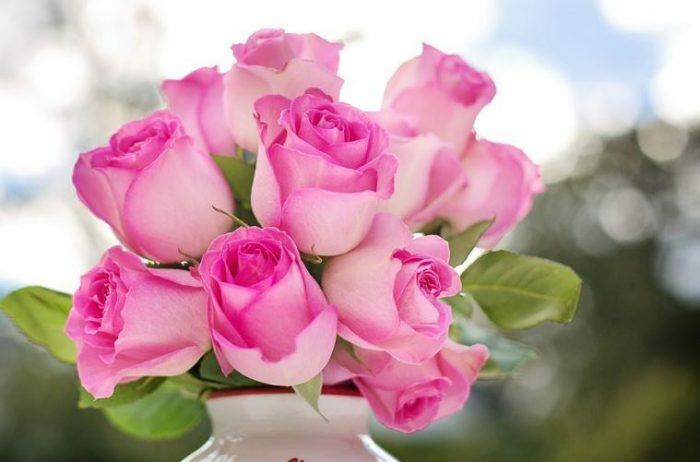 Who can’t deny the charm of pink rose, often sent on Valentine’s Day? The bright roseate flower with an abundance of prickles is always associated with the grace, elegance, admiration, and appreciation. It’s no surprise; the bouquet often becomes the center of people’s attention on a special day. The pink perennial takes a simple treatment to cultivate the five-sepal perennial from the genus of Rosa– watering it once a day is enough. In addition to the garden ornament, the petals are great to enhance the flavor of your herbal tea. 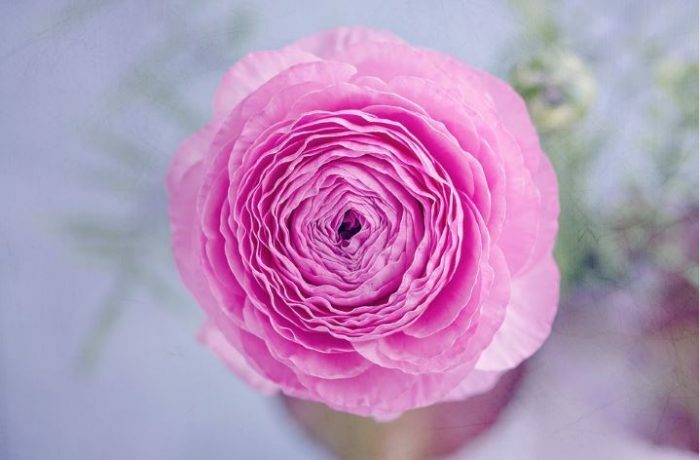 Ranunculus popularly known as buttercup looks very delightful, definitely matching with the romantic scene or bridal decoration. Although most out of the species are best-known with the shiny yellow petals, the pink variation can’t be disparaged. Growing wild and sprawling with spiral leaves and curly stems, the poisonous plant (when it’s eaten) can be found anywhere under the temperate weather. True to its name which means “radiant with charm”, the blossom always fascinates all flower enthusiasts and wedding organizers. 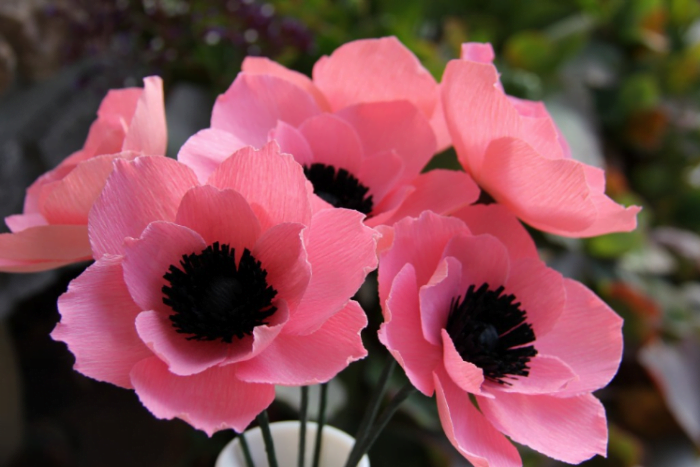 Pink anemone is a perennial that is able to flourish during spring, summer, and fall. 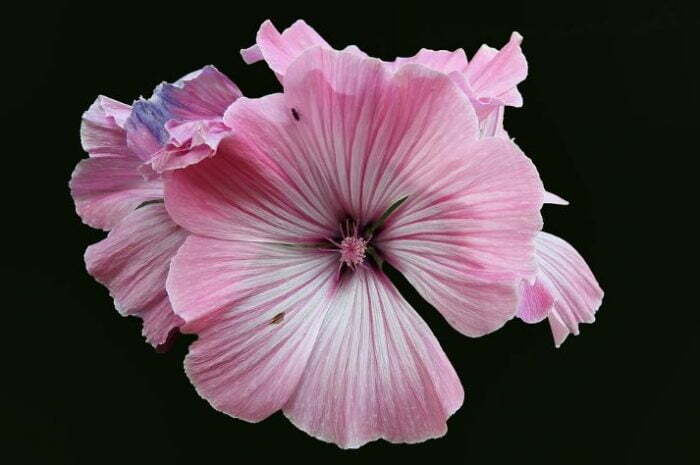 What makes it so graceful is its delicate blush petals and prostrate or upright long stems. Meanwhile, the leaves have plain shape with some sharp blades and toothed margins. The sepals vary from 4 to 27 segments. 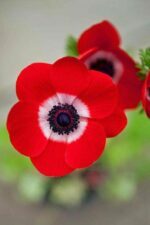 Often called wind flowers, the long-lasting anemones are nice for patio decoration. Although they can multiply on the wet area which is normally cooler, the disturbance from its surrounding can be a serious matter. Zinnia basically has close relation to the sunflower and daisy. Native to the northern and southern America, the shrub living in arid grassy land comes with different types of color including the pink one and stiff petals, ideal for your colorful hedge and tropical garden. 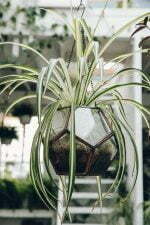 The dark to pale green leaves also vary from ovate to linear. The flowering plants are incredibly able to attract numerous butterflies and hummingbirds due to their radiant appearance. Besides, they are fine with the scorching summer temperature. 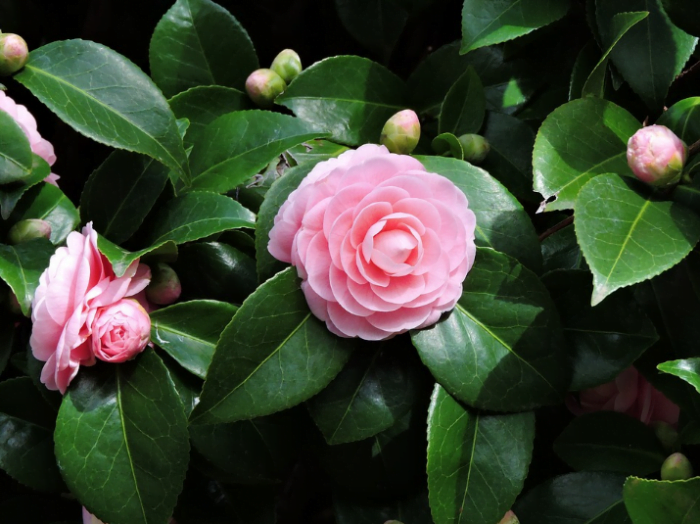 Camellia, a flowering plant from the family of Theaceae, is very popular in East Asia – it has multifarious names such as cháhuā in China, dongbaek-kkot in Korea, hoa chè in Vietnam, and tsubaki in Japan. The blossoms which have bright petals varying from yellow, red, to pink and glossy dark foliage are apt for the mainstays of your lovely garden. With a height of 6 to 15 feet, the rose-like shrub is usually used for hedges, border, or even bonsai plant. If you are hunting for a flowering plant that has a long blooming season, the blanket flower or Gaillardua x grandiflora would be the right pick. 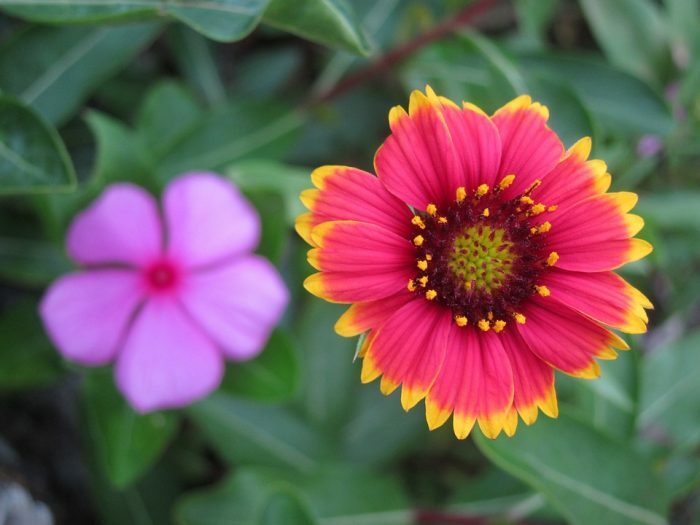 This flower has a number of similarities with the daisy and comes with different shades such as pink, yellow, orange, and red. It’s no wonder; you will see numerous captivating butterflies sucking the nectar. 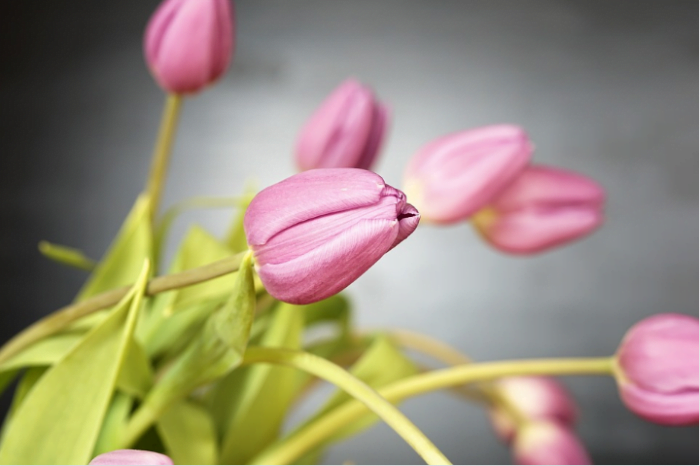 Tulip is one of the most familiar flowers in the world that is always associated with the Netherlands – in a matter of fact; it originates from Turkey and Iran. Regardless the color and size, its existence always makes everyone fall in love. The blossom with ordinary look is handy to create serene atmosphere and real coziness outdoors or indoors. 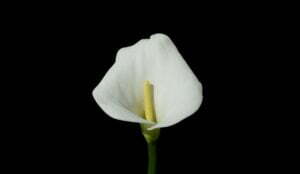 This beautiful flower which literally means perfect love has numerous symbols based on the colors. The pink and red symbolizes true affection. 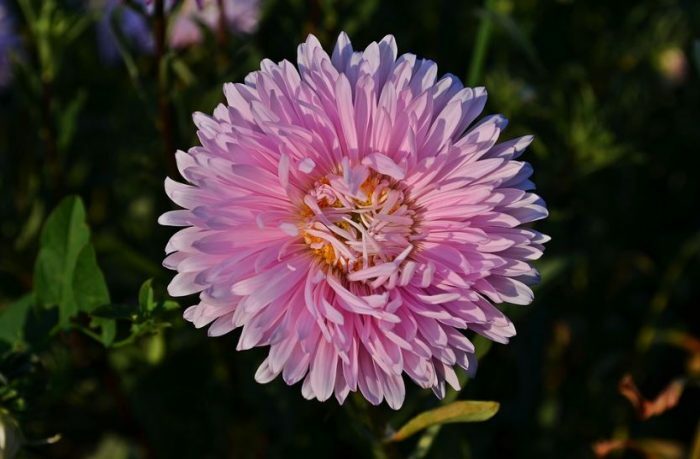 Aster uniquely has star shape, carrying a dazzling array of pleasant colors to your vast backyard garden during late fall and summer. It can thrive in varied zones and grow up from 8 inches to 8 feet. The adorable perennial has lance-shaped leaves and is able to produce different kinds of shades of pink, white, red, and blue. If you are about create a beautiful flower arrangement, cut the blossoms when the dusk comes to keep away from the bee visitors. Lotus flower originating from Southern Asia and Australia has a lot of symbols such as beauty, purity, richness, serenity, elegance, wealth, and fertility. 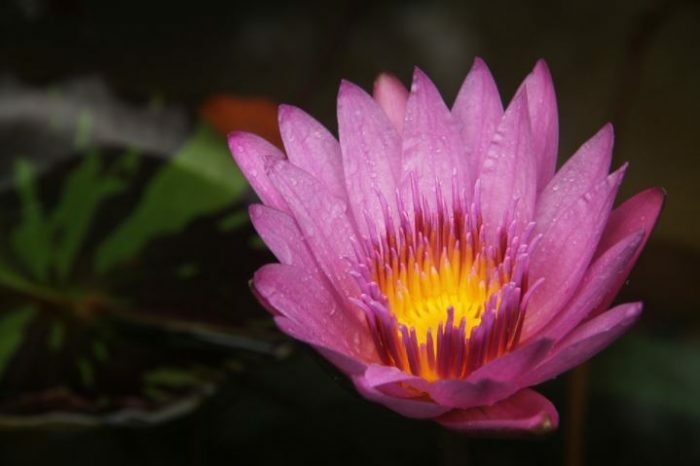 The aquatic perennial which is mostly used for religious and spiritual purposes in Buddhism, varies in colors (the pink and white are more popular than the rests). It usually grows in the muddy and shallow waters under mild temperature – the cold surrounding is likely the flower’s threat. What makes it keep floating is due to the long stems filled with air spaces. Orchid is one of the most favorite grown house plants due to its color and fragrant. 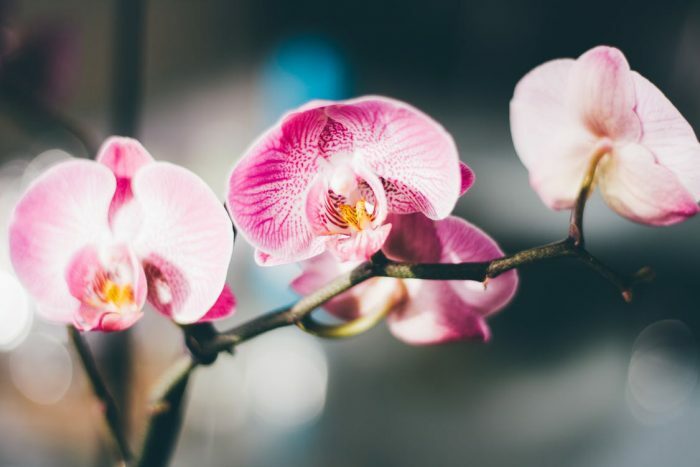 Belonging to the Orchidaceae family, it’s found that the total amounts of species are about 28,000 in the entire world including Epidendrum, Bulbophyllum, and Pleuthorallis. The perennial herb can be grown along with two patterns – the monopodial and sympodial. To cultivate it, you need to know what type of media suitable. Thus, we recommend you to apply the mixture of fir bark, peat moss, cork, rocks, and charcoal. 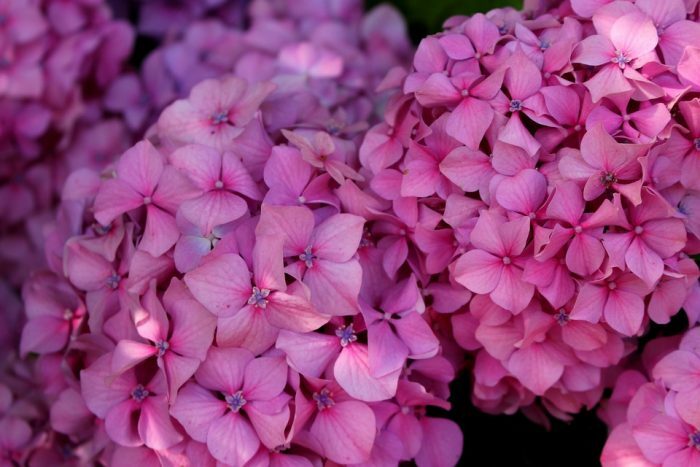 What makes Hydrangea’s charm is so enticing is its enormous flower heads that vary in colors such as bright pink, violet, lavender, and pure white. Some like mophead and lace cap are interestingly able to change the color due to the level of soils’ acidity (Ph). If you are craving for light pink flowers, use acidic soils having a Ph greater than 5.5. No matter the weather and soil condition are, the beautiful lady is genuinely effortless when it comes to the cultivation. 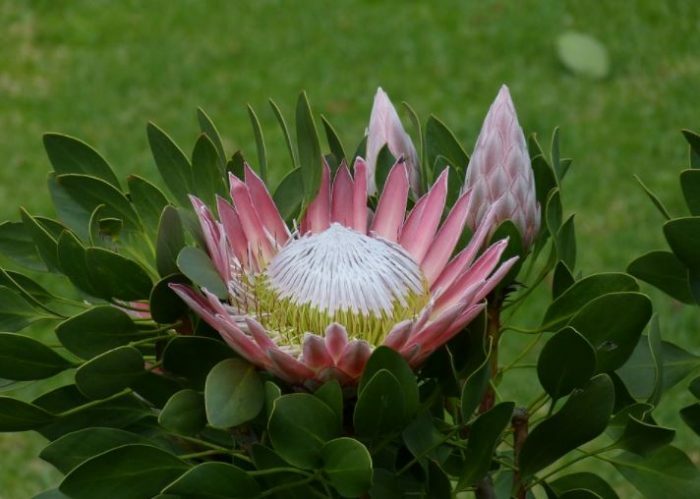 Protea belonging to the family of Proteaceae has captured the botanists’ attention since the 17th century. The woody shrub originating from South Africa and Australia uniquely has some flower heads surrounded by immense splashy bracts, thick stems, and glossy foliage with dark green color. The interesting fact about the plants is they can produce 6 to 10 flower heads within one season. 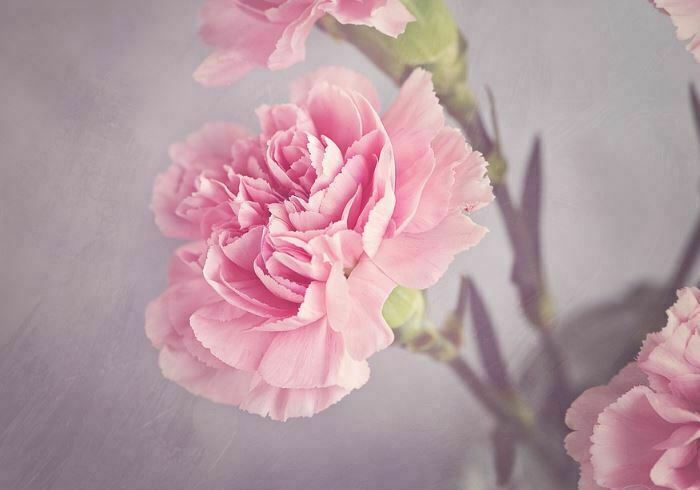 Carnations coming with a scientific name called Dianthus would be your one of the most cherished flowers. Their colors vary from pink, dark red, green, and white, to purple. 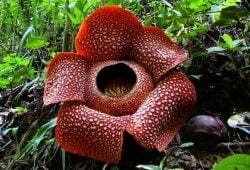 Best known as the flower of God, it has 5 beautiful petals and grows up to 8.5 cm in diameter. If you are about to make your living fence enticing, growing the hibiscus would be something great. Belonging to the genus of Malvaceae, the shrub can be grown in a temperate area with enough sun (between tropical and subtropical regions). 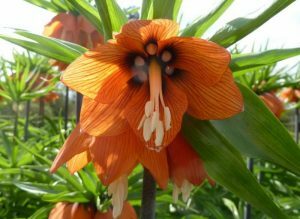 It has 5 wide trumpet-shade petals that vary in colors such as pink, peach, red, yellow, and orange and lanceolate leaves. It turns out that the flowers are also used as food, beverage, paper, and folk medicine. 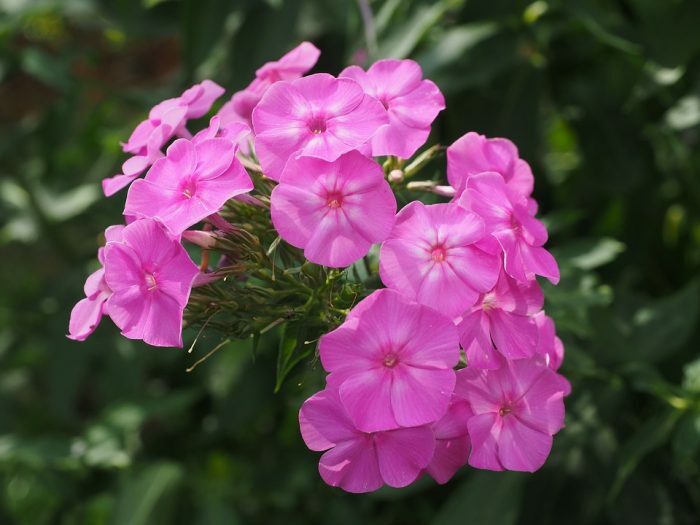 Phlox are perennials having numerous charming star-shaped petals once they bloom. 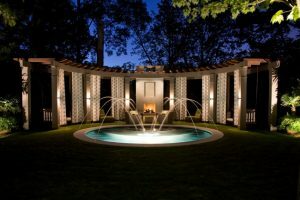 They have distinct types of colors ranging from pink, violet, bright red, to pale blue making your sweet garden filled with vibrancy and fascination. Unfortunately, the plants can’t be grown in the tropical area – mostly found in cold habitats from open prairie and woodland to alpine tundra. Besides, they are also the main food source for rabbits, deer, and larvae. 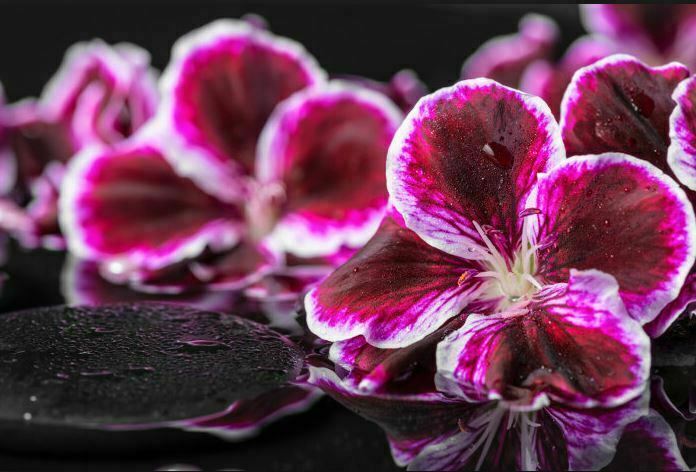 Geranium flowers famously known as Pelargonium x hortorum in the scientific field are not only for the garden’s bedding plants, but they are nothing yet excellent for the indoor space’s decoration, as well as the patio’s embellishment. The biennial and perennial plants, living mostly in the temperate Eastern Mediterranean region have five beautiful symmetrical petals from pink to purple. They need well-draining potting soil when it comes to the cultivation. 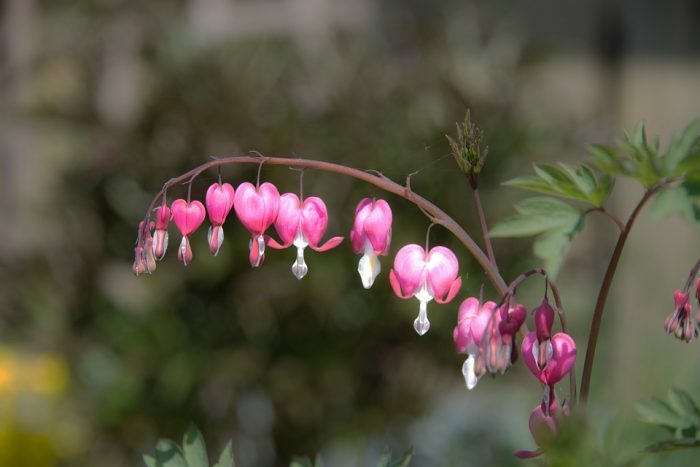 Bleeding Heart flowers usually recognized as Lamprocapnos spectabilis is often found in northern China, Korea, Japan, and Siberia. The heart-shaped red flowers basically have some petals with two colors – the fuchsia-pink outer petals and white and bright white inner ones. What makes them so adorable is the heart shape with the droplet-like part. In order to breed well, they require moist surrounding. Hollyhock flowers might draw the people’s attention as the fluffy heads bursting with dark to bright pink always stun among other perennials in the backyard. 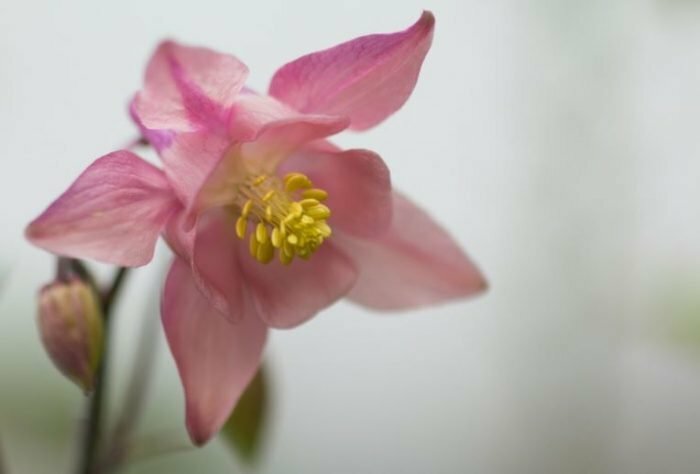 The elegantly shaped petals with medium size are fabulously nestled in the small tree trunk – these are the major reasons why most out of the gardeners are crazily devote their time to them. The round disk carrying seeds is produced at the end of their life cycle. 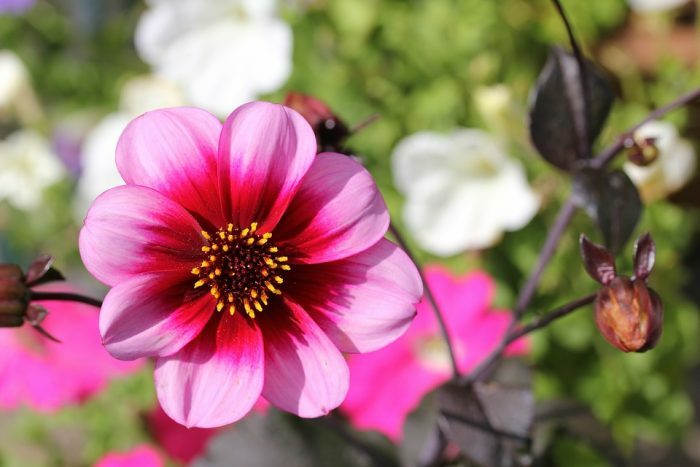 Dahlia is a type of herbaceous and bushy perennial plant having close relations to zinnia, sunflower, and chrysanthemum. There are plenty of variations like size and color. The gorgeous flowering plants mostly have tuberous roots and herbaceous stems. Belonging to the group of Asteraceae, the exotic blossom comprises of several florets. In the field of philosophy, the Dahlia embodies instability as well as dignity. 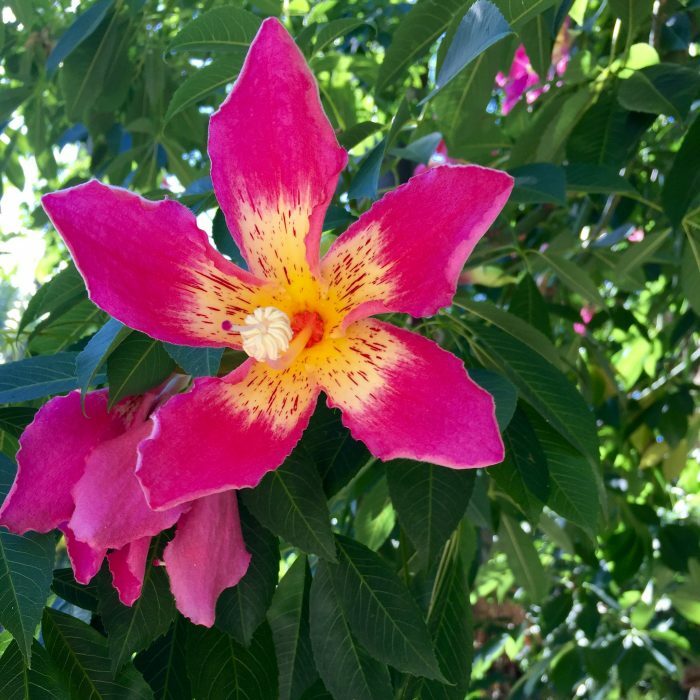 Another pink attraction on your backyard garden must be the Ceiba flower. 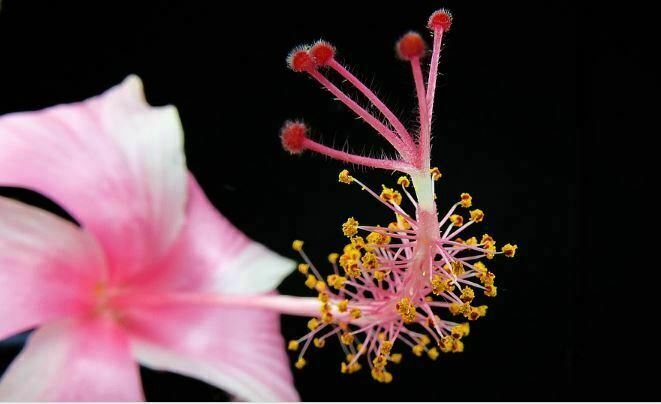 The blossoms are actually produced from a large tropical tree that is mostly found in Central America, Mexico, and South America – even it can reach up to 50 meters high. Widely known as false kapok, the towering plant has a unique elongated emerald green trunk. The fascinating fact is that the stem is able to produce its own food. 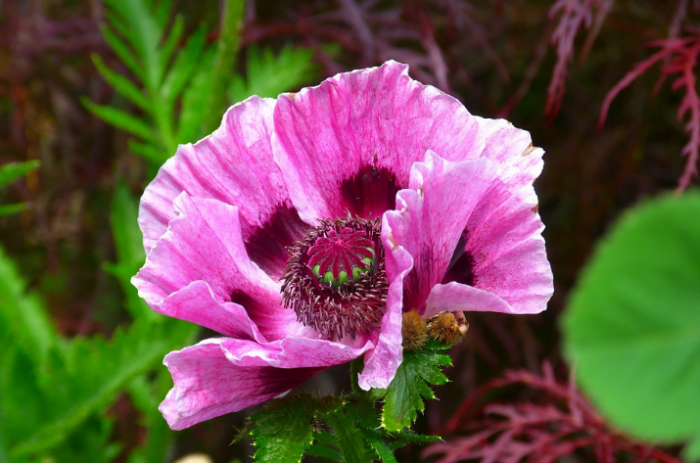 Poppies are short-lived perennial and herbaceous plants that can grow up to 4 feet. The flowers can contain 4 to 6 thin lovely petals crumpled in the buds and varying in color from pink, red, to yellow. The stamens create a flagrant circle attracting bees and butterfly. The blossoms living in the eastern and southern part of Asia usually bloom under the temperate weather during spring and early summer. Columbine flowers are categorized as the member of the buttercup family. 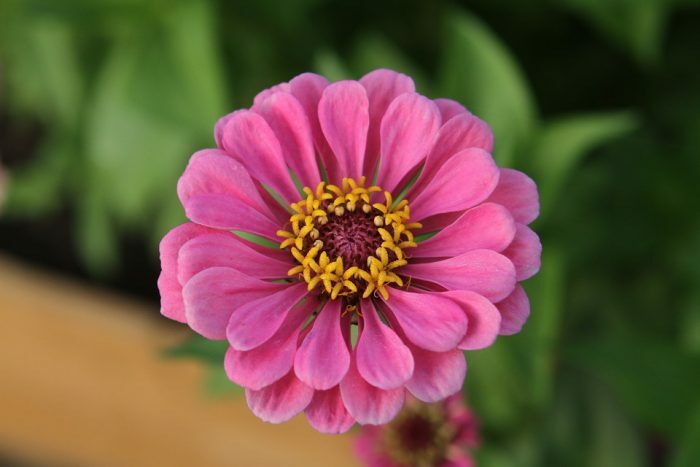 The herbaceous perennial plants come in different types of colors such as pink, blue, yellow, purple, and red. Additionally, the airy blossoms have engaging foliage. In a good condition, they can grow around 2 feet. What makes them so attractive is the present of spurs (thin and long horizontal strips situated on the side of the petals. 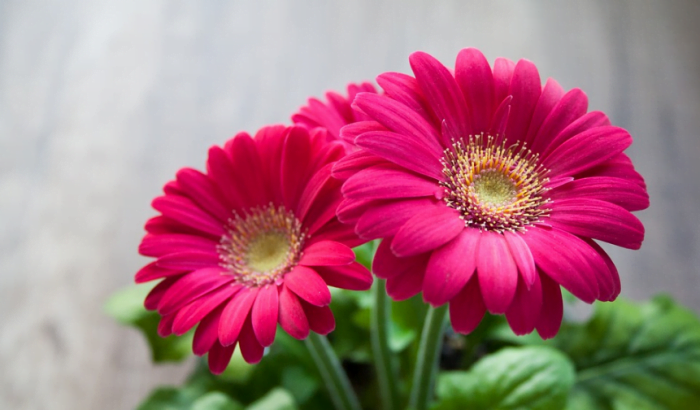 Gerbera that belongs to the genus of Asteraceae is originally from Africa, South America, and Africa. It features an immense capitulum and two-lipped ray florets having different types of colors such as pink, white, orange, yellow, and red. The head’s size ranges from 7 cm to 12 cm in diameter. The pink flower perennials are not only used for garden decoration but also as cut flowers. 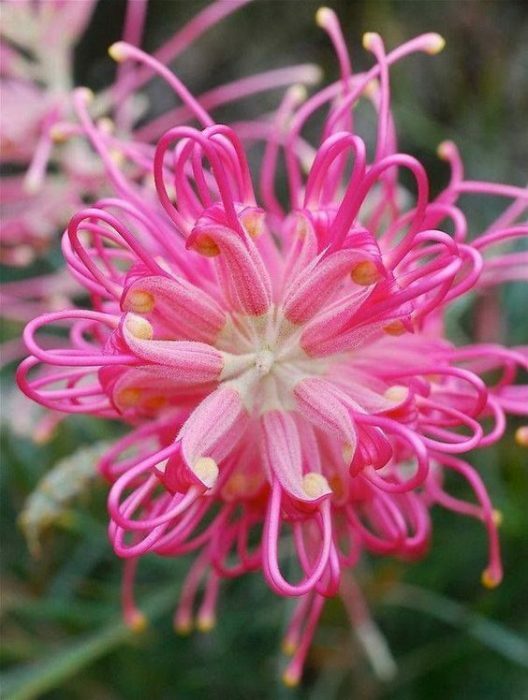 Grevillea flower is one of the evergreen flowering plants that originate from the Oceania territories such as Australia, New Caledonia, and New Guinea. It has several common names such as spider flower, toothbrush plant, and silky road. 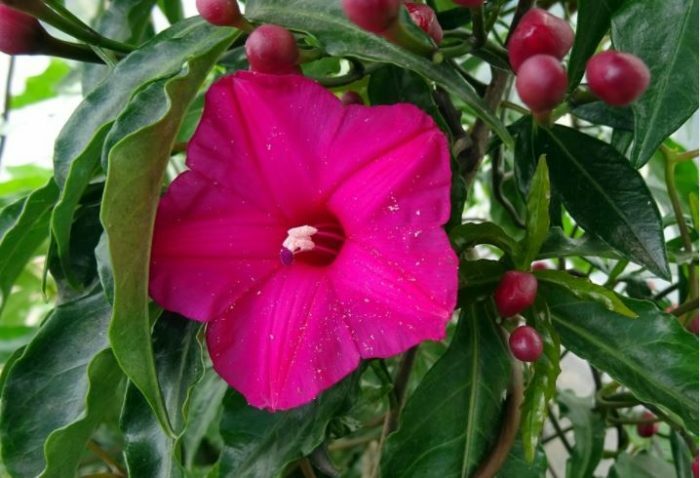 The shrub being able to grow up to 35 meters has fewer petals with bright colors. The birds, as well as the honey eaters, are often attracted to the cute species.